I have the joy and privilege of working with one of the most talented artists I've ever met. She has two Etsy shops filled with stunning, detailed, handmade work. In celebration of Mother's Day this year, she has agreed to share her gift with my readers! Please have a look around her website and her two Etsy shops: IAdornU and MaryBethsArt. I have no doubt that you will be impressed by the vibrant colors, elaborate detail, and yet simple elegance of all she has to offer! For example, check out this gorgeous, handcrafted bracelet! What an incredible gift this would make! 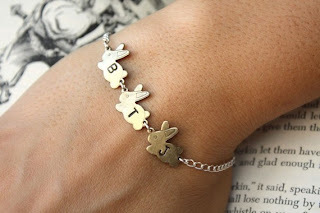 I know I would absolutely love to have one of these with my children's initials etched into the charms. I'm betting your mom (or you) would love it too! Go to Mary Beth's Etsy Shop to purchase this beauty for only $24.00! Go to one of Mary Beth's Etsy Shops and tell me what other item you'd love to have from her. Please leave a separate comment for each entry. This giveaway is open to all residents worldwide. The winner will be chosen using random.org on Friday, May 6th, 2011 at 8pm PST. Please leave your email address in your first entry so that I can contact you if you are the winner. Once a winner is determined, that person will have 48 hours to respond to my notification or another winner will be chosen. I did not receive any monetary compensation for this review. All opinions are 100% my own. I follow you via gfc as pralinka! my favourite item is Personalize Your Wings and FLY Necklace- Gold Chain - it's just perfect! and so pretty. Put your button on my blog..
second entry for my post.. I absolutely love the light green whale locket! I found you throught the Not so Moody Monday blog hop! Have a very happy Monday my dear! I love this giveaway! I follow Twingle Mommmy on Twitter. Love the brass knot necklace. I would get the whale loop necklace in silver! I follow you thru GFC! entry one. GFC follower of yours! entry two. following @TwinglesMom42 on twitter! entry one. twitter follower of @TwinglesMom42, entry two! following @marybethsart on twitter! entry one. twitter following @marybethsart entry two! following @twinglemommmy on twitter, entry one! following @twinglemommmy on twitter, entry two! FB fan of Twins Plus One, Three Times the Fun, entry one. Twins Plus One, Three Times the Fun, fb fan, entry two. fb fan of IadornU, entry one! FB fan of IadornU, entry two! Oh gosh. I. Love. The. BUNNIES!!! Cutest bracelet ever!! I follow you, of course, via GFC. I am following Mary Beth on Twitter. I am following Twingle Mommy on twitter. I am a follower of the co-sponsor's blog. I liked IadornU on facebook.